Autumn sunset on vineyards around Saint-Emilion with hills grapes and trees in Medoc region near Bordeaux France. Power and finesse. No, this will not be a column about LeBron James. Rather it is about the wine that, when properly grown and made, is renowned for those two characteristics. The most widely planted wine grape globally, cabernet sauvignon is the definitive king of grapes. 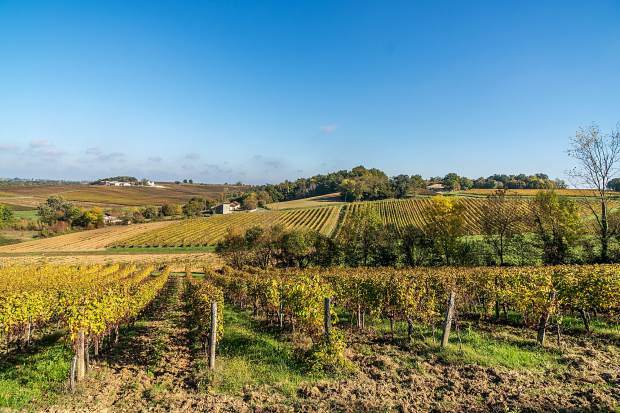 It is the go-to for collectors and consumers alike, and places where it thrives, like Bordeaux, France, and Napa, California, are among the most widely admired wine regions on Earth. So why is cabernet sauvignon so treasured? The obvious reason is because it is delicious. At its best a cabernet sauvignon can be a revelation. It will be big, bold, dark and impressive in the glass. The nose will give hints of tobacco, coffee, leather and spices, as well as the dark, hardy fruit from which it is made. Tip the glass and the velvet nature of the liquid will lead many to pronounce it as “full bodied,” a catch-all phrase for saying the wine feels good, and has weight and substance on the tongue. There will be drying tannins that make the mouth pucker and the taste of fruits like black cherries, blackberries and currants will converge to make you feel as if you are consuming the bounty of a basket of black/dark berries. You may taste elements of wood, or the oak in which the wine was aged, which might provide additional notes of vanilla or spicy cloves. Acidity will also be a mark of a good cabernet sauvignon, making it a good candidate for aging. And for pairing with food. Bottom line? The intrinsic power of great cabernet sauvignon, coupled with the deft touch of a winemaker who can achieve levels of smooth finesse, make for a wine that is the most popular on Earth. But there may be other reasons for the popularity of cabernet sauvignon. One is that supply may create demand. The grape is grown globally and there is no shortage of the wine on the shelves of liquor and wine shops throughout the world. If we make it they will buy it seems to be the mantra. And the perception of just what cabernet sauvignon is appeals to many levels of wine drinkers. If you are a so-called connoisseur of fine wines you want to drink the best and for the past century or more the best wines on Earth were considered to be the cabernet sauvignons from the first growth estates of Bordeaux. More recently the cult cabernets of Napa have become among the most collectable wines in the world. For more pedestrian drinkers, more affordable versions of the wine, from places like Sonoma, Washington state and Paso Robles, provide both the panache of a regal grape and great value. In fact, good, affordable cabernet can be found from not just domestic makers but also from other countries like Australia, Chile and Argentina. And did I say that they pair well with food? Red meats, especially grilled red meats, pair perfectly with a cabernet sauvignon. A great steak and a cab may be the single most ubiquitous pairing of all food and wines. But try a beautiful blue cheese, like a Stilton or a nutty cheddar, with a delicate Bordeaux or a lower alcohol Napa cab for a post-meal treat. So where did cabernet sauvignon come from? It has been cultivated for making wine since the 17th century in Bordeaux, but it was not until 1996 that the grape’s actual origins were known. Wine’s greatest sleuth, Carole Meredith of UC Davis, used a then-fairly new technology of the time, DNA fingerprinting, to determine that the origin of cabernet sauvignon was the result of a mixed marriage. Apparently, at some point in the later part of the 1600s, the red grape cabernet franc and the white grape sauvignon blanc got together and produced an offspring with the name, appropriately, of cabernet sauvignon. This was a serendipitous happening, as vintners were not cross pollinating wine grapes in those days. The result of that collaboration has been a boon to winemakers and wine lovers the world over. Not only has cabernet sauvignon become the most planted grape and launched thousands of steak houses throughout the world, it has also become the house grape for Americans. There are many of us who like to try a variety of different wines, but there are few who don’t love a good glass of power and finesse. A good glass of cab.